The first step to consider is to decide what type of pond you want to build. You should consider what type of aquatic life you want in the pond. Is it going to be a home for goldfish or koi? Or is your main concern for the aquatic plants? Perhaps you only want the pond for the sound of a waterfall. Each type of pond will need to be planned for its specific features. Keep in mind that the most common mistake water gardeners say they made when building their first pond was making it too small. A small pond limits the number of fish and plants you can add. A koi pond is different from a water garden because koi limit the amount of plant life available to be grown. Simply put: koi eat some plants. A koi pond should also be larger because koi get quite large despite the size of the pond, it is recommended that a koi pond be no less than 1000 gallons in volume, the bigger the better. It also needs to have an area of the pond at least 3 feet deep, 4 - 5 wil be better. A water garden typically contains both goldfish and a variety of aquatic plants. Water gardens in moderate climates usually need for an area of the pond to be at least 2 feet deep. Colder climates require a depth to provide at least 12" to 16" of water below the freeze zone. The second step in establishing a new pond is to select the proper location. Most ponds will be enjoyed more if they are installed close to the home. Select an area where you can see the pond year round. Ponds are great attracters of wildlife including birds and butterflies. Position the pond where runoff from rain will not flow into the pond. This may carry fertilizers, chemicals, and organic debris into the pond. It may be necessary to alter the terrain to accommodate this. Avoid placing a pond too close to trees. Falling leaves and other debris will need to be removed from the pond. You will want to place your pond where it will receive at least 4 to 6 hours of direct sun if you want to grow water lilies. Shade is fine for fish-only ponds. Water circulation is not essential but the use of a pump will allow you to keep more fish, it will keep your plants healthier. A pump is required to run a filter, fountain, or waterfall. The sound of running water adds greatly to the enjoyment of the pond. Most ponds will benefit from the use of a biological filter. This is essential if you are keeping koi or more than a few goldfish. We have several types of biological filters to choose from. Now you need to determine the size of your pond or water garden. The best way to do this is to use a rope or water hose and lay out the shape on the ground. A pond for goldfish or water lilies need be only about 2 feet deep for zones 5 or greater. Ponds built in colder areas may need more depth to keep the pond from freezing solid. Ponds built for koi should be close to three feet or deeper to allow these larger fish enough space. The biggest mistake that most people make is building the pond or water garden too small. A larger pond is more stable and easier to maintain. Keep in mind that a finished pond or water garden will be about 30% smaller than you visualize it. After you have laid out the shape, measure the maximum length and width. 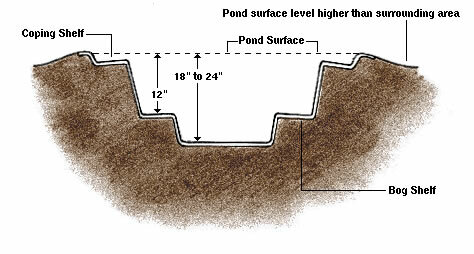 Add the depth twice to these measurements plus a foot or two for overlap and this will give you the pond liner size. Dig the pond or water garden to the desired shape and dig a shelf around the perimeter of the pond about one foot deep and one or more feet wide. Dig the remainder of the pond with a slight slope to the end opposite the waterfall if one is included in the design. Position any external pond filters and/or pond skimmers and level these in their proper location. 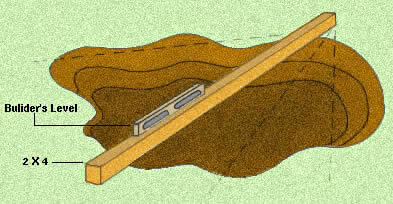 Pond skimmers should be buried to the proper level beside the pond. A ditch should be dug for the plumbing from the pond to the waterfall or external pond filter. If a pond skimmer is being used, dig a ditch to the external pond pump and from the pump to the external pond filter or waterfall. If you are using a submersible pump in the pond skimmer then the ditch will be from the skimmer to the external pond filter or waterfall. Line the pond or water garden excavation with Pond Underlayment. This can be cut with scissors or a utility knife. You may want to tape any small pieces together to keep them from moving when the pond liner is placed. Place the rubber pond liner into the excavation and unfold. Position the liner evenly in the pond. Try to minimize folds and wrinkles but some will be necessary. After the water is added the folds should flatten out. Pond waterfalls and streams can be excavated now. 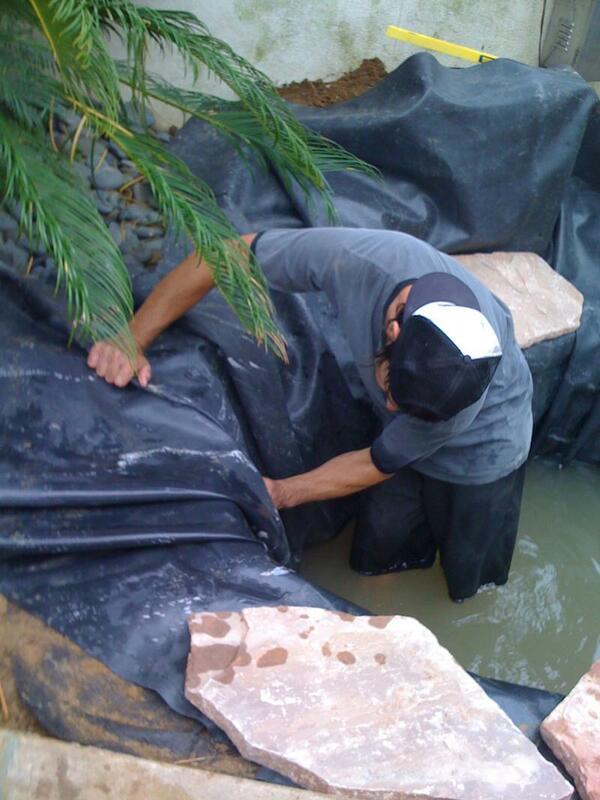 An external pond filter or waterfall tank can be positioned to create the first waterfall. This can be placed to spill directly into the pond in which case the pond liner is held against the pond filter until you are able to stack stone from the pond shelf up against the pond filter to create a waterfall. If a small pool or stream is desired then excavate this several inches deep and to the desired size and shape. Position the underlayment and pond liner allowing extra material to overlap several inches into the pond. Plumbing from the pump can be brought over into the stream or pool or again if using an external pond filter this will be the start of the waterfall. Streams should be dug wider than the finished size to make room for stone that will be placed into the stream for the edging. Stone can be secured to the liner with mortar or expandable foam. This will hold back the water allowing it to spill over the stone creating the waterfall.